Millions of people who are overweight have found success with the ketogenic diet, also known as the keto diet. This diet is a low carb, high fat diet. It actually shares many similarities with the Atkins diet and other low carb diets like it. The whole point of the diet is to drastically reduce the carbohydrates that you consume, and replace them with fat. When you reduce the carbs in your diet so drastically, it can put your body into a metabolic state known as ketosis. For most people, dieting can be difficult. If you are a busy person, it can make dieting even more difficult. If you are busy with work, family, and social engagements, you may not have time to eat a healthy, home cooked meal everyday. Some people have such little free time that they have to turn to fast food just to get something to eat. 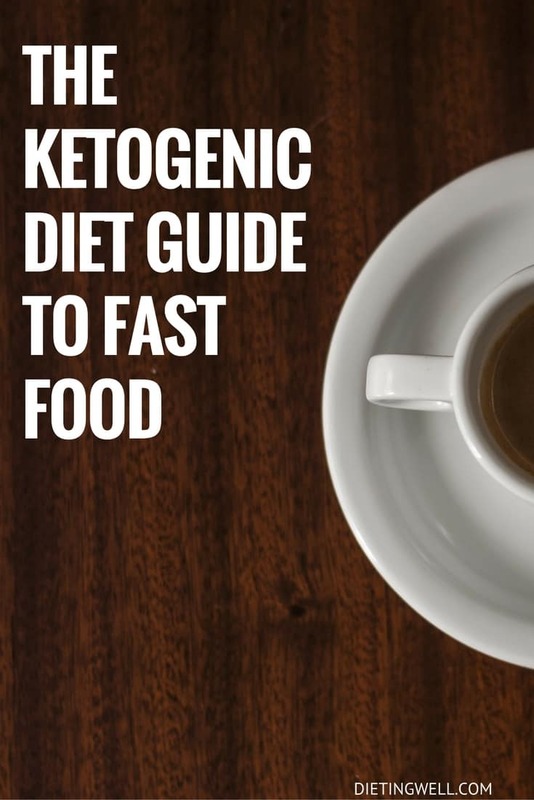 If you are following the ketogenic diet, luckily, there are certain dishes at fast food restaurants that you can order and you won’t be cheating on your diet. Some of the foods come the way that they are served and some you would need to put in a special order. Below is a list of some of the most popular fast food restaurants, and the meals that are keto friendly. If you follow this guide, you can eat fast food and still stick to your diet. When most people think of Five Guys Burgers, they think of the ridiculous amount of carb loaded fries that come with each burger. If you have the willpower to pass on the fries, you can enjoy a nice, keto friendly meal at this burger joint. If you order your burger with no bun, they won’t give you a hassle. You can either ask to have your burger wrapped in lettuce or have it put in a to-go box. Either way your order it, they will accommodate. When it comes to toppings, you can pick anything from the board. The best thing to order is a bacon cheeseburger. If you order extra bacon or cheese, they won’t charge you. If you are planning to eat at the restaurant, you can enjoy the free, all you can eat peanuts in the shell. These are great for the keto diet and they might be able to curb your craving for their greasy fries. Jimmy Johns is one of the only fast food restaurant who offers a keto friendly meal. When you order the Unwich, you won’t need to ask for any substitutions to make it keto friendly. It already is. Every sandwich on the menu can be ordered as an Unwich, which substitutes the bread and tortilla for a lettuce wrap. Every sandwich on the menu can be a low carb version. You can either pick up your food at Jimmy Johns or you can have it delivered. One of the best things about Jimmy Johns is that they have a customized nutrition menu builder on their website. You can use it to add your sandwich into your daily calorie tracker. If you are craving a spicy, Mexican meal, Chipotle is the place to go. Sure, many of the dishes on the menu are loaded with carbohydrates, however, if you order the right dish, you can satisfy your craving and still stick to your diet. The most keto friendly dish is the burrito bowl, minus the rice and the beans. If you aren’t in the mood for a burrito bowl, you should order a salad. It can include meat, lettuce, cheese, sour cream, and the hot tomatillo red chili salsa. This has the least amount of carbs out of all of the salsas that they serve. If you are willing to spend the extra money, you can add guacamole to your salad. The salad will be high in fat and low in carbs. Exactly what you want on the keto diet. In-N-Out Burger may have a high fat, high calorie menu, however, they do have a few healthy things on the menu as well. The first is The Flying Dutchman, and it is extremely keto friendly. It consists of two meat patties with two slices of cheese. The best part is there is no bun. There isn’t even a lettuce wrap. If you want condiments on your burger, you would need to ask, as the Flying Dutchman doesn’t come with condiments. If you don’t want the Flying Dutchman, you can order the Protein Style Burger. With this burger, they swap out the bun for a lettuce wrap. To avoid carbs, you should request that they don’t put the house spread on your burger. Instead, ask for pickles and mustard. If you are planning to eat out at Hardee’s/Carl Jr’s, you can eat any of your three meals there and still stick to your keto diet. This restaurant understands their customer’s need to eat healthy and lose weight. Also, the staff is very knowledgeable on their healthy menu. This establishment has an excellent keto breakfast that you can eat on the go. It is called the Low Carb Breakfast Bowl, and it contains eggs, cheese, and meats. Everything in the breakfast contains no carbs. If you plan to dine at Hardee’s/Carl Jr’s for lunch or dinner, they have a keto friendly menu for those meals as well. The Low Carb 1/3 Thick Burger is a low carb version of the original, as the bun is replaced with a lettuce wrap. If you are in the mood for chicken rather than beef, you can try the Carb Charbroiled Chicken Club Sandwich. This sandwich is also served on a lettuce wrap. If you are tracking your calories, you can visit the restaurant’s website to find the nutritional information of your meal. Many people on the keto diet avoid going to Panera Bread because of the name. Everyone knows that bread means carbohydrates. You can still go to Panera Bread and find low carb options. There are a few salads on the menu, where without any dressing, they are a keto friendly option. There are also a few items on the menu that you may not have noticed because they are in small letters in the back of the menu. If you are going to Panera Bread for breakfast, you should try the Power Breakfast Egg Bowl with Steak. This dish has just 3 grams net carbs. The Power Breakfast Egg White Bowl With Roasted Turkey has just 4 grams net carbs. This is lower than what you can find at most breakfast diners. If you are going to the restaurant for lunch or dinner, there are three dishes that you can try. The first has 7 grams net carbs, and it is called the Power Mediterranean Chicken. The Power Mediterranean Roasted Turkey Bowl has just 7 grams net carbs. Finally, with just 6 grams net carbs, the Power Steak Lettuce Wrap is an excellent option. If you are tracking your nutritional intake, you can find the nutritional information about each dish on the Panera Bread website. McDonald’s and Burger King are great places when you are on the road. You can find at least one in even the smallest town and the prices are very reasonable. Both of the restaurants offer very similar menus. If you are visiting either restaurant for breakfast, you should order a breakfast sandwich, and ask for it without the bun. Some employees may look at you like you are crazy, but do you really care? If you are going for lunch or dinner, you can do the same thing. Order your burger without the bun. One of the best burgers to order is the McDouble. It is on the value meal, and without the bun and the ketchup, it is very keto friendly. Most of the establishments will serve the burger in a bowl and they will add some lettuce. Without the ketchup, this meal has just 4 grams net carbs. If you must have ketchup, it will add an extra net gram. The turnover of employees at these establishments is very high, therefore, many of them may not understand the policy on custom orders. You may need to explain exactly what you want and let them know that you order it all the time. If you are tracking your nutritional intake, you can find all of the information that you need on their website. Wendy’s, like McDonald’s and Burger King, offers keto friendly foods at a very reasonable price. The Wendy’s Double Stack from the Right Price Right Size Menu has just 4 grams net carbs. It has a meat burger, cheese, and onions, tomatoes, and pickles. The toppings are entirely up to you. Just be sure to ask for no bun. If you don’t want beef, you can order the Ultimate Chicken Grill Sandwich. Just be sure that you order the grilled chicken and not the breaded version. That one is loaded with carbs. You would need to order this burger sans the bun, and it has just 5 grams net carbs. If you are going to eat at KFC, you cannot have fried chicken. Chances are you already knew that. You can, however, have grilled chicken. The grilled chicken has between 0 and 1 gram net carbs. You can order a 3 piece meal and call it a day. Most of the sides on the menu are loaded with carbs, however, if you order a single serving of the green beans, it will only add 2 grams net carbs to your meal. If you are more in the mood for a salad, the Caesar or house side salad is good, as long as you order it without dressing or croutons. If you don’t have the willpower to avoid them, the dressing has 1 gram net carbs and the croutons have 2 grams net carbs. If you are going to have dressing, stick with the Heinz Buttermilk Dressing packet. Avoid the Creamy Parmesan Caesar Dressing, as it contains 4 grams net carbs. Currently, the Grilled Double Down Sandwich is not on the menu. If it ever comes back, you should order it. It has just 4 grams net carbs. Years ago, when the Atkins Diet was huge, Subway offered low carb wraps. Unfortunately, these are no longer on the menu. If you want to go to Subway, you need to make your own keto friendly meal. You can order a sandwich and just turn it into a salad. You can get as many toppings with your sandwich, which is more than enough for a hearty salad. If you want to choose the meats with the lowest carb count, you should go with the Grilled Chicken Breast. To make it a great salad, ask for spinach. If you want a dressing, olive oil has 0 grams net carbs. If you want some flavor, the next healthiest choice is the ranch dressing, which contains 4 grams net carbs. If you are going to order breakfast, you can order any of their breakfast sandwiches without the bun. After that, feel free to add any toppings you like. Most people think that they won’t be able to find anything healthy at a gas station or convenience store, however, more and more establishments are offering breakfast sandwiches in the morning. If you just remove the bun, you will have a quick, keto friendly breakfast. If the establishment offers eggs, string cheese, or deli meats, those are also excellent choices. If you are looking for a healthy snack, try pork rinds or almonds. Just because you are on the keto diet, it doesn’t mean that you need to cheat when you are forced to eat on the run. Each of the food choices listed above are not only tasty, they are also all low in carbs. Next time you eat fast food, you don’t need to feel guilty. Another good one is Pollo Loco. You can get a single piece of grilled chicken with a side of steamed broccoli and ranch to dip it in. if you have chick fila near you they have many good chicken options. my fav is the grilled chicken club wit lettuce cheese and bacon just no bun. Chic fil A is one of my favorites for the Grilled Chicken Club. Also, Kneaders has an amazing turkey, bacon, avocado salad as well as a Greek Omelette. I’m finding many choices available. If you go to Subway, know that the chicken is 50% chicken. Meaning that the rest is flavoring and soy. Most restaurants that were tested were around 85% chicken DNA. Not Subway. missing A&W pappa or grampa burgers – no bun ofcourse. What about Steak n Shake? They have a taco salad with beef and you can omit the crunchy things?? Does anyone know. Make sure you are getting enough sodium and water in your diet. Drink a warm cup of chicken stock. That should help. should be noted that when ordering a veggie bowl at Chipotle, guac is no charge. What can you have for breakfast if you are allergic to eggs?